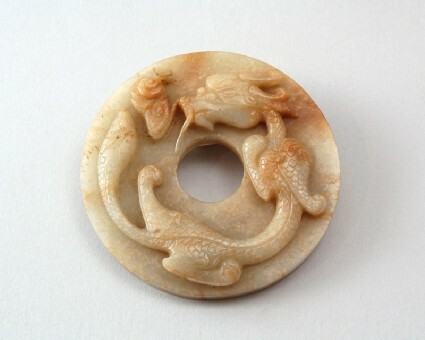 This piece is copying an archaic jade disc with a relief dragon, as they are known from the Han dynasty (206 BC–AD 220), but the dragon is not rendered in the archaic style, nor is the lingzhi an archaic motif. The piece is made of opaque pale green stone with brown patches. It has the form of a circular disc with a central hole, with a dragon in high relief on one side. The dragon, with large head, thin body, rudimentary limbs and a long bushy tail, holds a lingzhi (longevity fungus) in its mouth. On the reverse the disc is carved in low relief with a band of archaistic scroll motifs and dots, surrounded by a thin rope border and another band of scroll motifs and dots, grouped in oval panels, with a thin diaper pattern filling the spaces between.